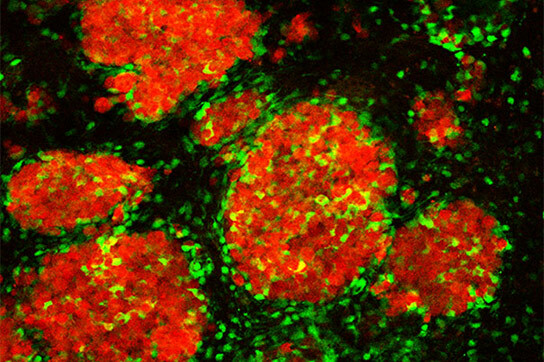 Tagged therapeutic stem cells (green) targeting breast cancer metastases (red) in the brain of a mouse model. Researchers have developed an in vivo imageable breast-to-brain metastasis mouse model. Using real time in vivo imaging and subsequent composite fluorescence imaging, they show a widespread distribution of micro- and macro-metastasis in different stages of metastatic progression. Harvard Stem Cell Institute (HSCI) researchers at Massachusetts General Hospital (MGH) have developed an “imageable” mouse model of brain-metastatic breast cancer and shown the potential of a stem cell-based therapy to eliminate metastatic cells from the brain and prolong survival. The study, published online in the journal Brain, also describes a strategy for preventing the potential negative consequences of stem cell therapy. In their search for novel, tumor-specific therapies that could target multiple brain metastases without damaging adjacent tissues, the research team first developed a mouse model that more closely mimicked what is seen in patients. They found that injecting into the carotid artery breast cancer cells that express markers that allow them to enter the brain (cells labeled with bioluminescent and fluorescent markers to enable tracking by imaging technologies) resulted in the formation of many metastatic tumors throughout the brain, mimicking what is seen in advanced breast cancer patients. Current therapeutic options for such patients are limited, particularly when there are many metastases. To devise a potential new therapy, the investigators engineered a population of neural stem cells to express a potent version of a gene called TRAIL, which codes for a molecule that activates cell-death-inducing receptors found only on the surface of cancer cells. Previous research by Shah and his colleagues had shown that two types of stem cells are naturally attracted toward tumors in the brain. After first verifying in their model that stem cells injected to the brain would travel to multiple metastatic sites and not to tumor-free areas, the team implanted into the brains of metastasis-bearing mice TRAIL-expressing stem cells, which reduced the growth of tumors. Injecting the TRAIL-expressing stem cells into the carotid artery, a likely strategy for clinical application, led to significantly slower tumor growth and increased survival, compared with animals receiving unaltered stem cells or control injections. The safe use of a stem cell-based therapy against brain metastasis would require preventing the engineered cells from persisting within the brain, where they could affect normal tissue and possibly give rise to new tumors. To facilitate removal of the therapeutic stem cells from the brain at the conclusion of therapy, the researchers created cells that, in addition to TRAIL, express a viral gene called HSV-TK, which renders them susceptible to the effects of the antiviral drug ganciclovir. Several tests in cultured cells indicated that ganciclovir would cause the death of HSV-TK-expressing stem cells, and testing in the mouse model confirmed that administration of the drug after successful treatment of brain metastases successfully eliminated therapeutic stem cells that also expressed HSV-TK. Shah and his team are currently developing similar animal models of brain metastasis from lung cancers and from melanoma. They also are working to improve understanding of the therapeutic efficacy of simultaneously targeting multiple tumor-specific molecules on the surface of metastatic cells within the brain and anticipate that their findings will make a major contribution toward developing novel targeted therapies for metastatic tumors in the brain. In addition to Shah, who also is an associate professor of radiology at Harvard Medical School, authors of the Brain report are co-lead authors Wanlu Du and Tugba Bagci-Onder, along with Jose-Luiz Figueiredo and Jordi Martinez-Quintanilla, all of the MGH Molecular Neurotherapy and Imaging Laboratory. The study was supported by National Institutes of Health grants and a grant from the James McDonald Foundation. Be the first to comment on "Targeting Brain Metastases with Stem Cell Therapy"